After an extended stretch of bitter cold temperatures, we went to 55 degrees on Wednesday and an amazing 66 degrees on Thursday here in southwestern PA.
On Thursday morning I checked the weather and saw a Winter Storm Warning. What? We were going to 60 or above today…was this a glitch? It was not. It was issued for FRIDAY at 1:00 p.m. for my county, lasting through Saturday. Yet the local weather said 55 degrees and rain for Friday and no ice / sleet / snow until Friday evening. 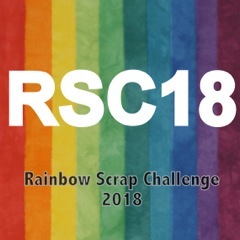 I’ll be linking up to the RSC18 Scrap Challenge at SoScrappy on Saturday. Tagged Airship Propeller, Applique, blues, Koopa, Little Baskets, Quilting, Rainbow Scrap challenge. Bookmark the permalink. Here in WNY we’re expecting a couple inches of rain, followed by a period of sleet or freezing rain before it turns cold and we get another 7-10 inches of snow. It was 60 degrees today and the ice in the creeks is melting fast, water is rising, sounds absolutely delightful – not! We too stocked up today and are hopefully ready for the onslaught. Your blues are pretty BTW! Right now ( Friday morning ) we have flooding issues in low lying areas and by creeks and rivers due to snow melt and heavy rains. Schools all closed / water rescues underway in places. The forecast changed to ice / sleet and 5-8 inches of snow later on. I very much like the blue basket that has the diagonal squiggles design. I don’t know how to better describe it. Hello, this weather is crazy. Here it will be 67° today and in the 20’s on Sunday. Blue is my favorite color, so I love all your pretty blues. Enjoy the warm weather while it is here. Happy Friday, enjoy your weekend! We are getting your warm weather. We woke up to 60 degrees after many days of 3 and 4! Tomorrow is supposed to be almost 70, but Sunday is going to be 15 again. Yuck! Oh well, enjoying today for what it is…warm! LOL I did notice your preference for blue lately, and wonder if, self consciously, you weren’t reflecting affection for Koopa! Crazy weather here, too. The same “warm” Thursday followed by frigid temps today and some ice – altho not the vicious storm we were promised! It’s never good when cites from your state show up on the Weather Channel. They were showing the water and ice flows and all the havoc they were causing. Hope you are home with the sewing machine, playing with fabric and staying warm. Very pretty blues in all your blocks. Blue can be a little overwhelming, but you certainly got a lot done. Enjoy the thaw out. We went from 30 to 80 in about a week here, and now I think we are headed back to 30 again. Such odd weather this winter! I really like the blues in your airship propeller block, and always enjoy seeing your little baskets, too! I hope the crazy and unpredictable weather is calming down some for you. Pretty blue baskets. Thanks for the link to chicken pot pie. I want to give it a try. Love all your blue projects, especially the Star Flower! Similar weather here – yesterday it was 60, then overnight it dropped below 20 and is dumping snow on us. Argh! What a roller coaster! I love those little blue baskets so much! Love this week’s blue blocks, especially the propeller block! I’m ready for winter to be over – way too much cold weather this year. Hope you fare OK during the latest batch of weather! Nice selection of blocks. I especially like the Airship propellers. What a great picture of Koopa. And what a nice use of fabric for your basket. Thank you Sally :) I took about 10 pics of Koopa to get 1 good one…he moves so fast!